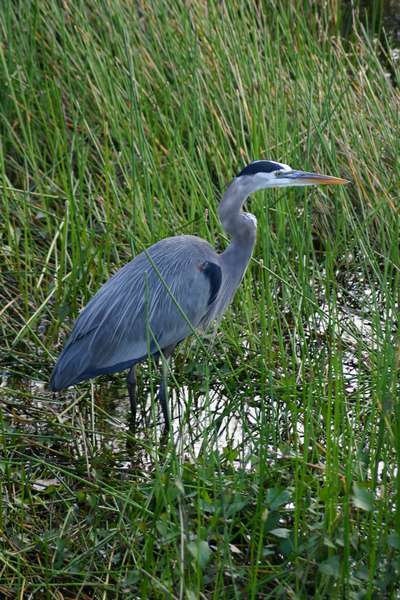 The Great Blue Heron may be the royalty of the bird kingdom. At over four feet in height and draped in spectacular plumage during the mating season, these royal birds strike stately poses. Its eating habits are pedestrian, though, and includes snakes, mice, frogs and insects as well as fish. 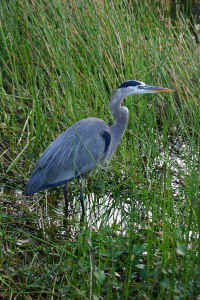 The great blue heron, frequently seen in the backwater bays, pond and lake areas is an alert and somewhat shy creature which will fly quickly when it senses an intruder. Coloring of the Great Blue Heron seems to run from a deep to light blue in the Everglades National Park (picture upper, left and center) to bluish-gray and gray at Ding Darling National Wildlife Refuge in Sanibel Island (upper, right) to reddish gray and tan during winter breeding at Venice Rookery (lower right). At dawn, this chick squawks at mama; then gives her a big heron hug! Great Blue-Heron mom and adolescent just ready to leave the nest.